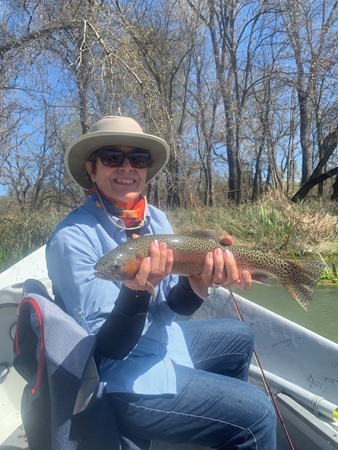 I stopped by Eagle Canyon briefly today and got to snap a quick photo of our guest Wenda with a great fish. She landed it on a size 16 flashback Pheasant Tail on 4X tippet under an indicator. It was a beautiful day up there! It was a wet one today! Kevin Kay and I worked together with a group of long time friends from the San Jose area. The guys were a lot of fun and they were all troopers given the conditions. For whatever reason, the fish were pretty tight-lipped today. We managed to get several grabs throughout the morning, but only hooked one fish by lunch. The afternoon was better and my guests Rick and Mark both landed some nice fish, but they also lost a few as well. Today was a tough day for everyone. The extended forecast is looking dry for at least a week, and then only a slight chance of rain. If the forecast remains dry, then I would expect the flows to remain at 30,000 for at least another 4-5 days and then they will hopefully start to drop. Mark with a nice one. 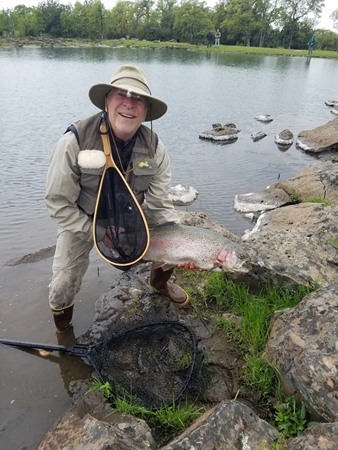 Unfortunately Rick's big one escaped the net while preparing to take a photo. I had a fun day with my guests Larry, and his grandson Aiden. 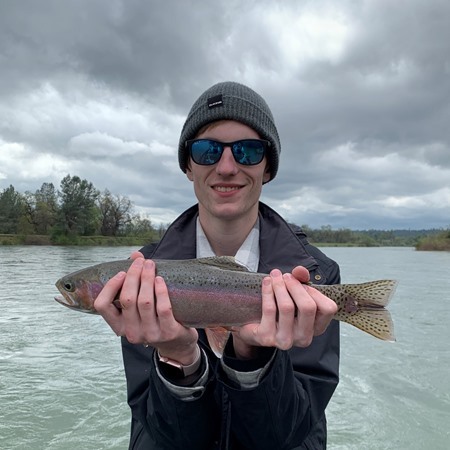 This trip was intended to be for Aiden’s 18th birthday - which was in January, but we had some scheduling challenges due to river conditions given the relentless rain we continue to receive. 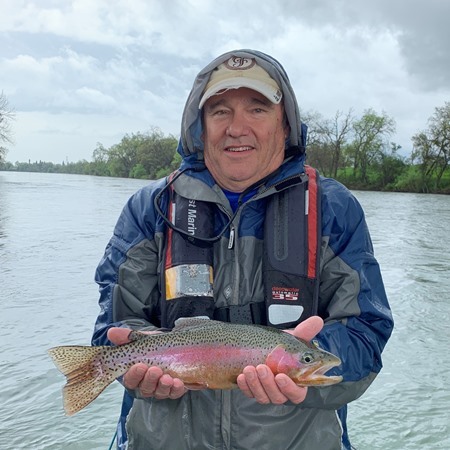 The flows were pushed to 30,000 cfs on Thursday and we experienced another biblical thunderstorm Friday afternoon, so the visibility was somewhat limited but the color is great. 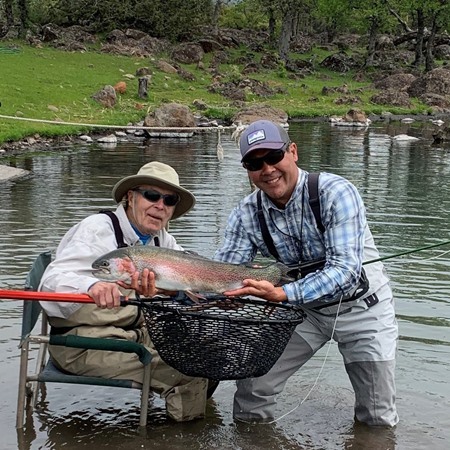 Even with the less than ideal conditions, Larry and Aiden hooked into some really nice fish throughout the day. 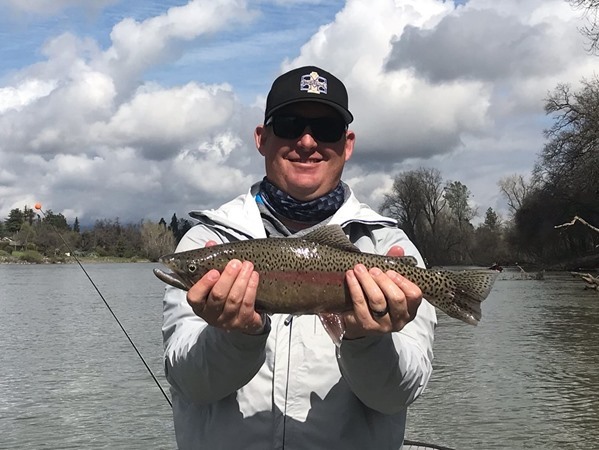 The fish are concentrated, so fishing these conditions will not yield consistent fishing all day – but it will be very exciting when you find some players! We have rain in the forecast tomorrow – but then there’s nothing but sunshine in the forecast! Who else is ready for spring? Aiden with a chunky one! I had a great time with my guests Dale and his son-in-law Miran. 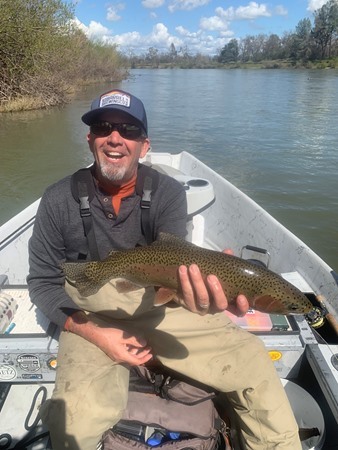 Dale has fished with my fellow Confluence Outfitters guides Dax and Leslie, but this was my first time with him on the Lower Sac. Miran had never fly fished before today, but he is totally hooked! 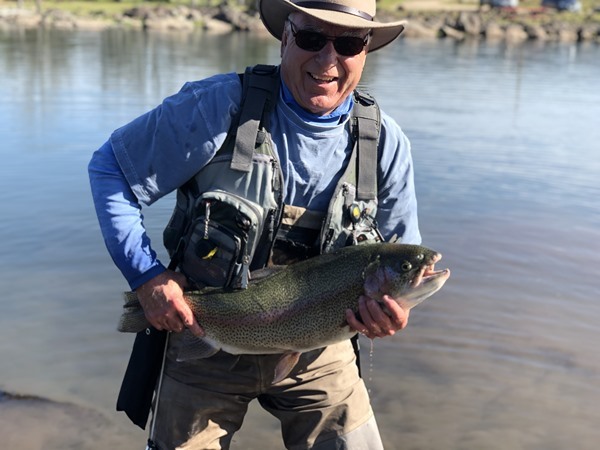 The flows had gone up to 20,000 cfs this morning so the fish were a little confused, but we still had a lot of hook-ups throughout the day. 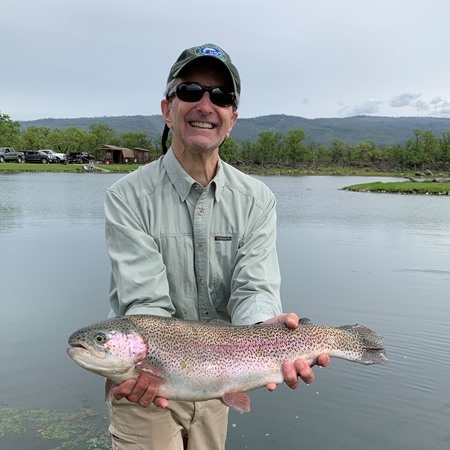 It was so cool to see Miran’s expression after landing his first trout on a fly rod! In addition to landing some nice fish, Miran also got to experience what it feels like to lose a really big fish. It was a fun day with lots of great memories! 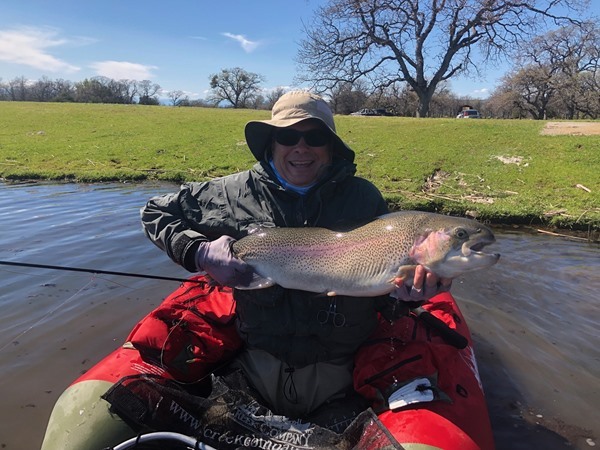 Guest report from Peter who fished Eagle Canyon today:"If I had to estimate, we probably both had over double digits in hits and hooking up. 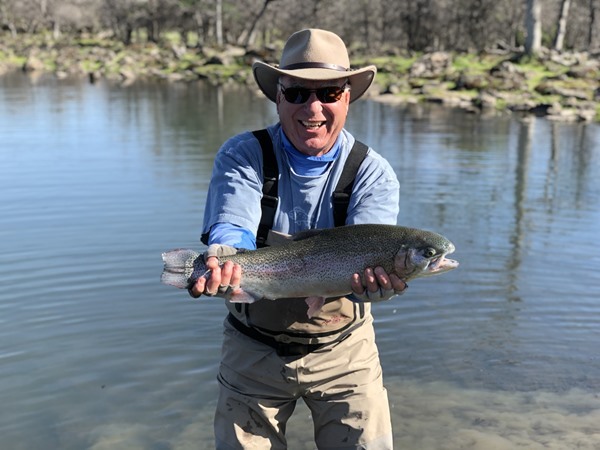 Our most successful flies were black and olive leach patterns and red midge We were able to measure one of them and it was 28-30” long and the girth was around 18.” In other words, it was a giant pig lol. Thank you again for the hospitality. 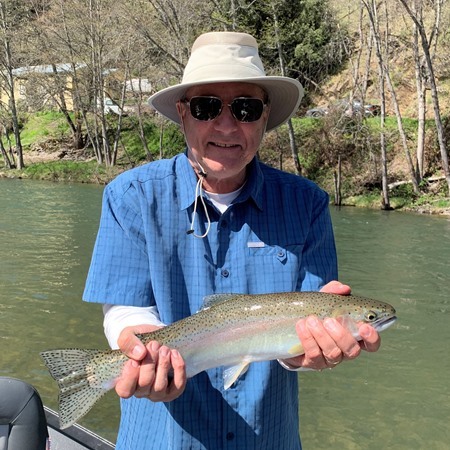 My father and I got to fish Eagle Canyon twice this year and we are looking forward to what next year brings." Today was a super fun day with my guests Will and Creighton. 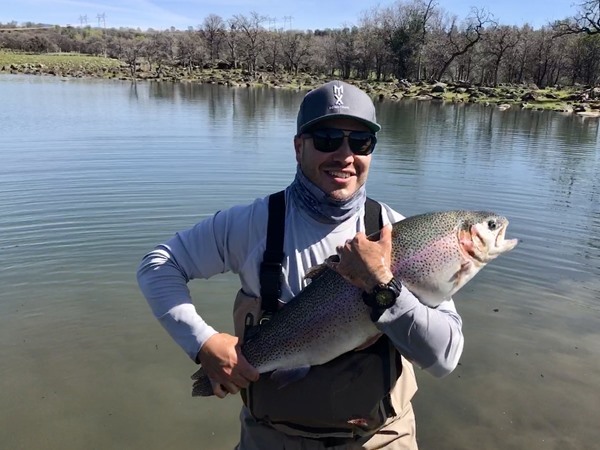 They recently moved to the Bay Area from Boston and this was their first time fishing in NorCal. The weather was perfect and the grab was pretty consistent throughout the day. I think they were surprised at how hard our fish fight as they ended up on the losing end of their first few hook-ups. 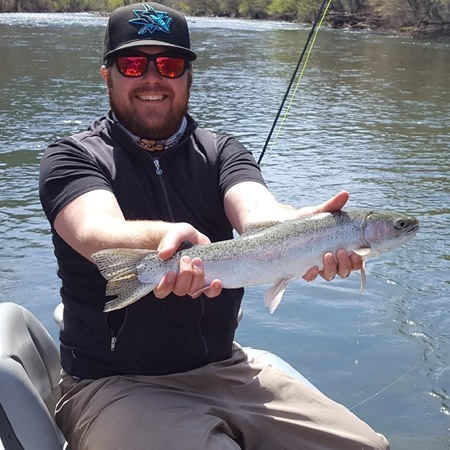 They broke the code and were able to land several really nice fish! We have more rain forecast for the coming week and the flows are scheduled to bump up to 20,000 cfs on Wednesday. It seems our never-ending winter has now morphed into our typical wet spring conditions. Who’s ready for summer? 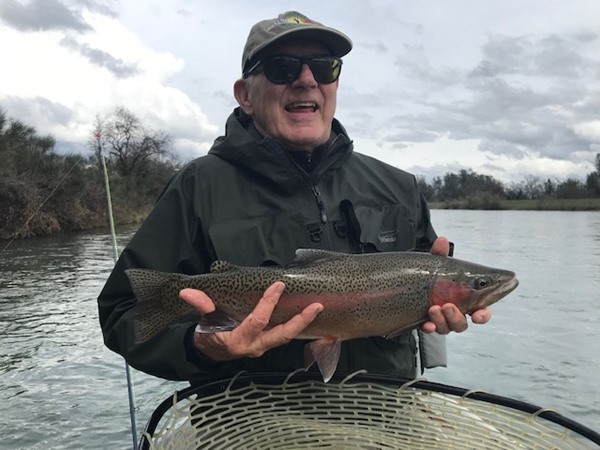 I had the distinct pleasure of fishing with Tim and Janie yesterday on the Lower Sac. 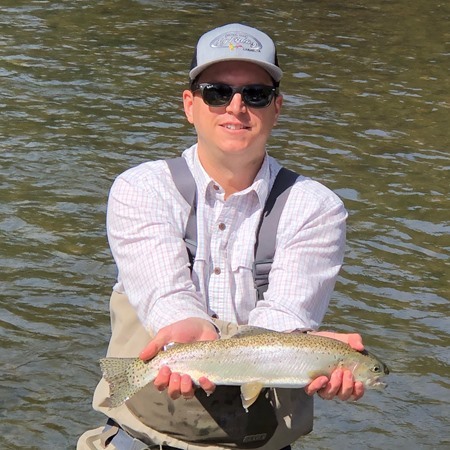 The weather was stunning, the company was wonderful and the fishing was really good. Janie proved to have the hot hand all day but both had lots of good fish. Morning grab was a litt slow, but we had an incredible afternoon. Most of our fish were in the 17 to 20 inch range as well. Fun. 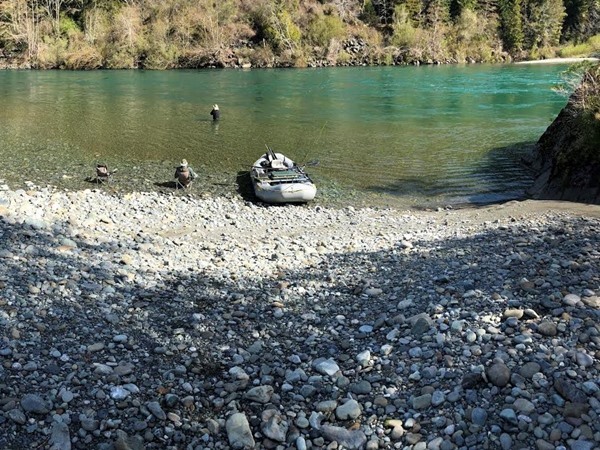 I just wrapped up my last winter steelhead trip of the season with Roff and Bob from Mendocino. We had a typical wet welcome for our first day that saw us on the Smith River due to everything else in the neighborhood being blown out. By noon the rain had lifted and gave way to a picture perfect spring day on the coast. We poked around up river but by days end came up empty handed. Day two we floated the main stem and had it nearly all to ourselves. A marked difference from earlier in the season that can see heavy boat pressure and bank pressure. We got Roff dialed into his spey cannon, a Sage X 10150. Yup, a 15 ft 10 wt. Roff got into a groove by mid day and was making some epic casts. Finally it came down to the last run of the day as the sun dipped behind the redwood curtain. Bob found one in the bottom of the run. 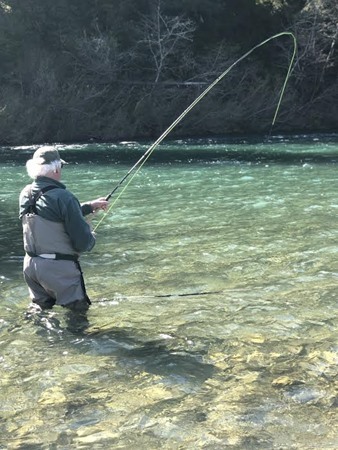 A shiny little buck hammered his fly on the hang down and preceded to but on a nice show for all three of us before we netted him and sent him on his way. 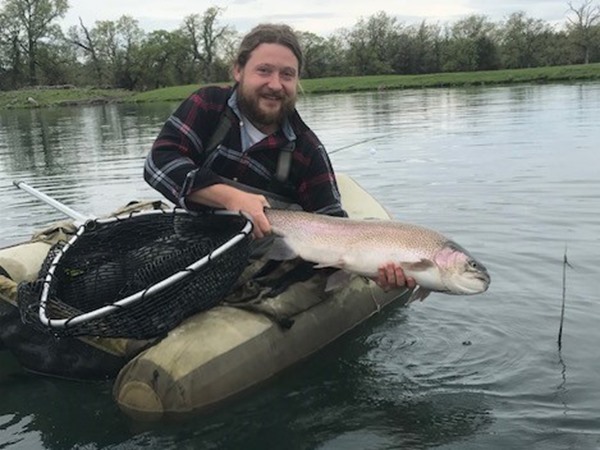 I can't think of a better way to end my season guiding for these elusive fish. 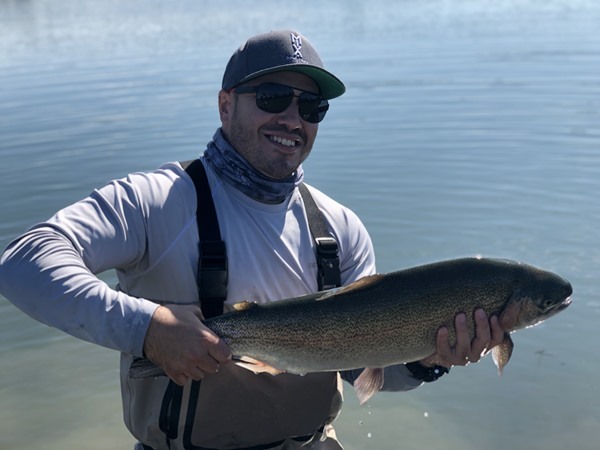 The last day of fishing for winter steelhead is coming to an end for the 2019 season. 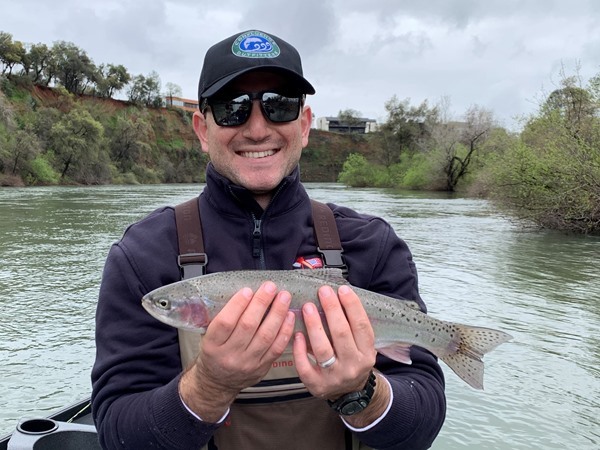 Most rivers will be closed starting tomorrow, 4/1/2019. 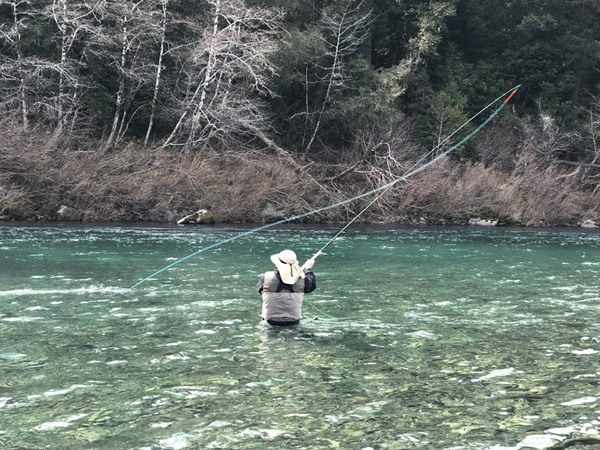 Two exceptions are the Smith River and the main stem Eel River. The Eel continues to remain high and muddy after recent rains took her off the table. 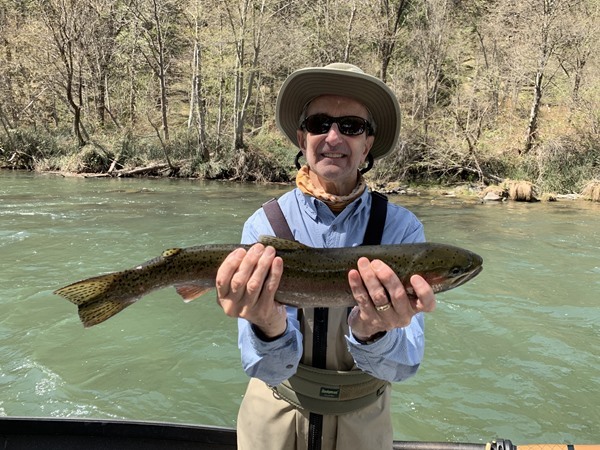 There was a window when nearly all of the South Fork was fishing and reports were good. The Main Stem came oh so close but again, no cigar. With more wet weather forecast into April it's anyones guess when the main will come back online. 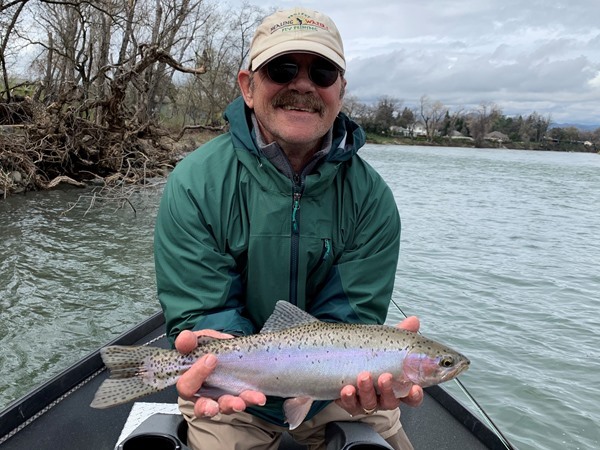 The Smith will see another nice bump of rain during this coming week, but fishing has slowed down considerably. Most of the fish in the system are down runners headed back to sea at this point. 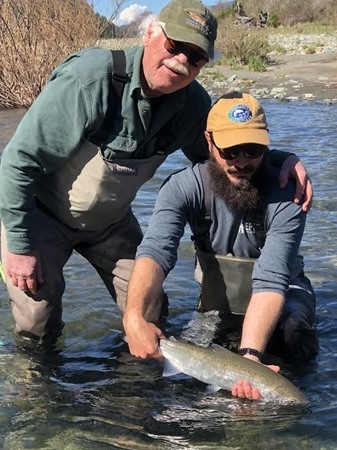 Although there are a run of smaller "blueback" steelhead that always make an appereance during spring, the majority of the fish have come and gone. 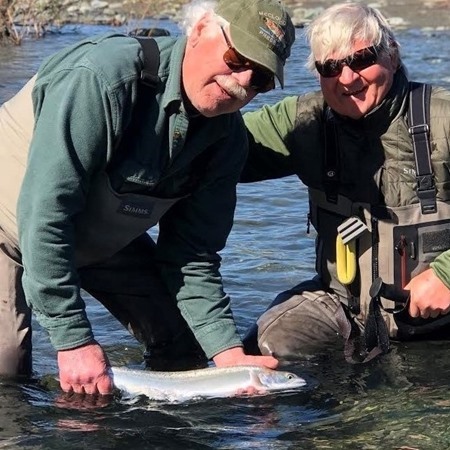 All in all it was a good season on the coast that saw better numbers of fish but fewer fishable days due to a very wet winter. The game certainly isn't for everyone but for those who braved cold mornings and soggy afternoons in the hopes of feeling that electric grab I am eternally grateful. Thanks to everyone who came and fished with me this season on the coast! See you next time. The Kern River Fly Fishers brought up so many people this year that they split into two groups. 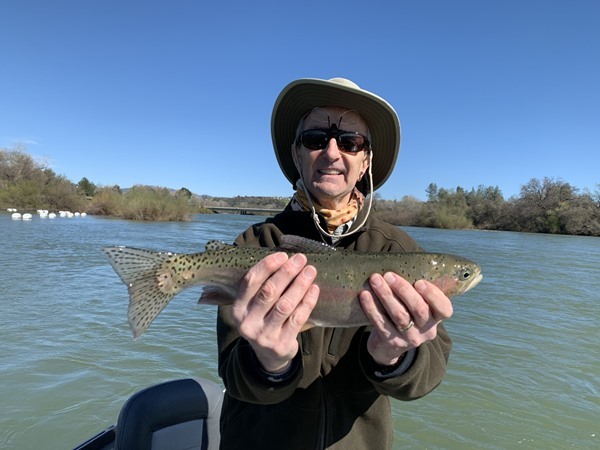 The 2nd group fished Lower Sac yesterday and Eagle Canyon today. They had good fishing both days and great weather. I had a great time today with my very good guest and friend Ted, and his wife Eloise. The weather was ideal and the water color is getting back to normal. 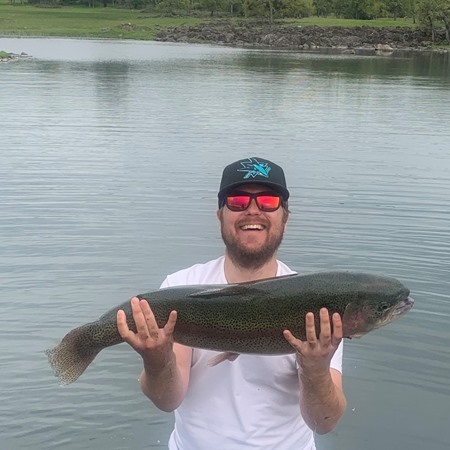 The morning bite was a little slow, but by mid-late morning it really turned on for us! 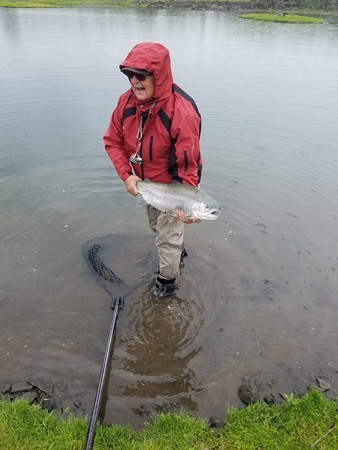 The afternoon was spotty, but when we found fish, it made for some fun times. Ted with a very nice birthday fish! 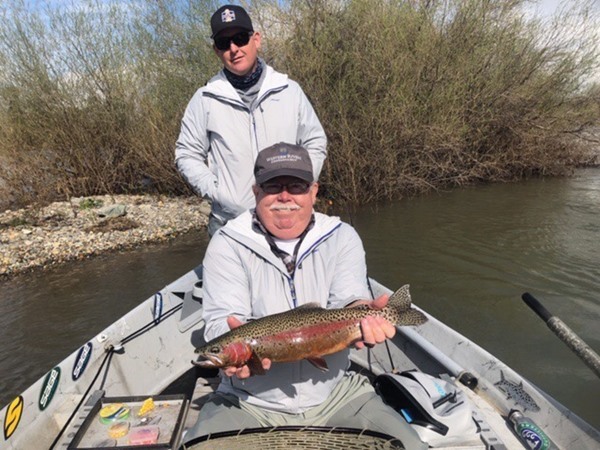 I guided Wayne and Robert with the Kern River Fly Fishers today. When we showed up at the ramp the river was really dirty. 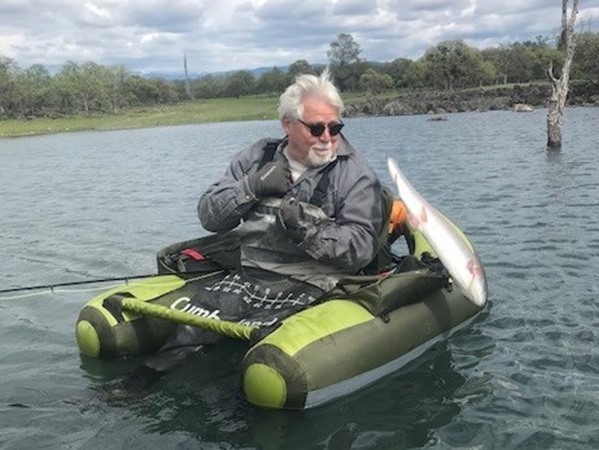 A lot of guides headed to Baum Lake, the Lower Feather River, and other alternate locales. I'm glad we stuck it out because the fishing was actually pretty good. 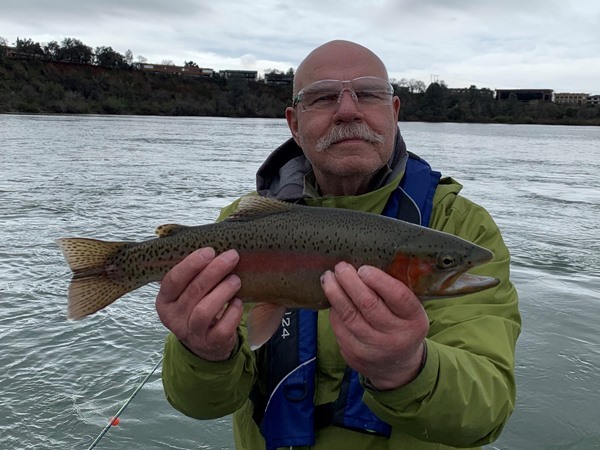 Robert landed his first ever Lower Sac trout and then a couple more. Wayne caught a couple big fish and some smaller ones too. The group had a great time. By the end of the day there was 3 feet of visibility and fish were eating small mayfly nymphs. 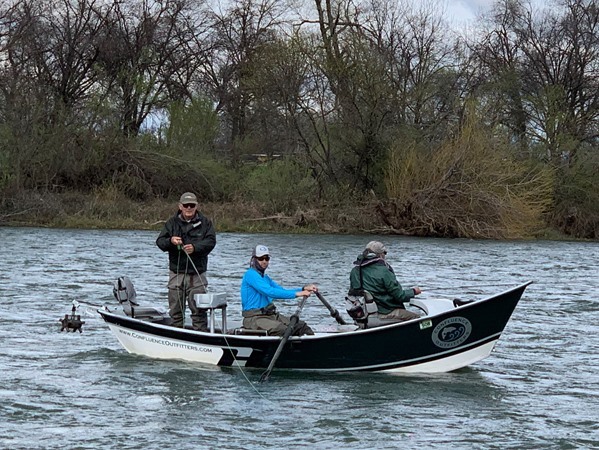 Today we had another group of anglers from the Kern River Fly Fishers and I was one of five boats. The water was off-color as the result of crazy thunderstorm that inundated northern Redding Wednesday afternoon. Despite the color everyone in the group were hooking fish. 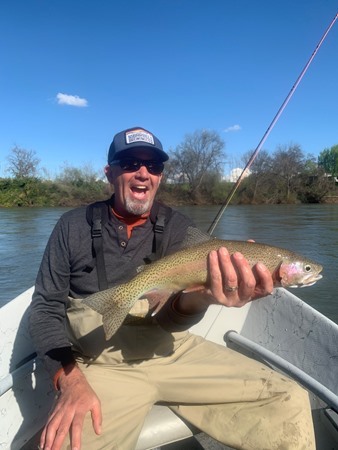 My guests Bill and Cort landed a few nice fish throughout the day, but found our lower Sac rainbows are fighters. Took a little drift down a high and slightly off-color Lower Sac today. Didn’t know how things were gonna fish but Sean did a great job of fininding some nice fish. It was a little harder than usual, but all in all a very good day. 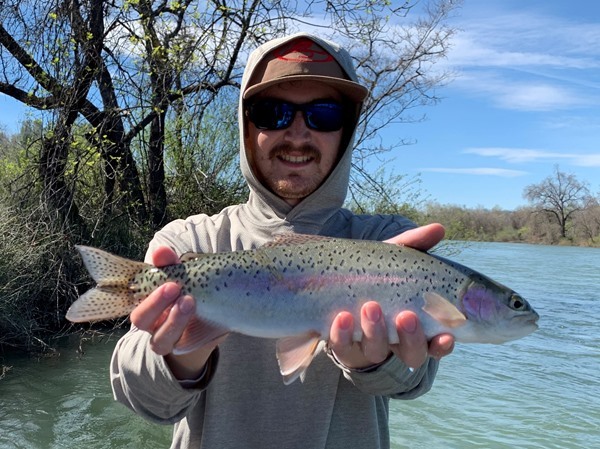 Some good fish to be found in the high flows. I had a really fun day with my guest Nellyda. This was her first time indicator nymphing and she was excited to learn the technique. After a week of consistent flows, the Bureau of Reclamation bumped them up to 15,000 cfs due to the rising lake level. 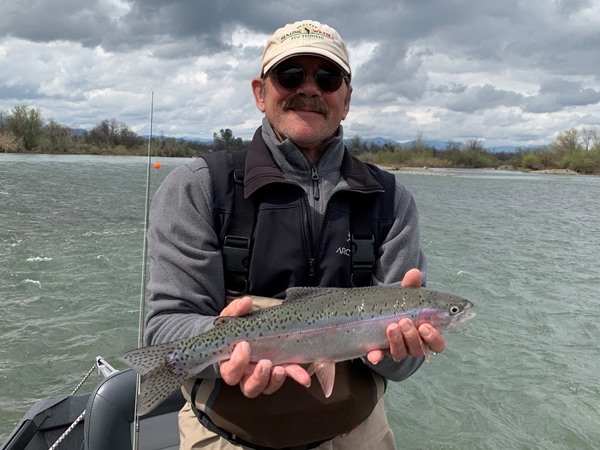 The increase slowed the bite, but we still managed to get several grabs and hooked into a few very nice fish until the strong south winds picked up. 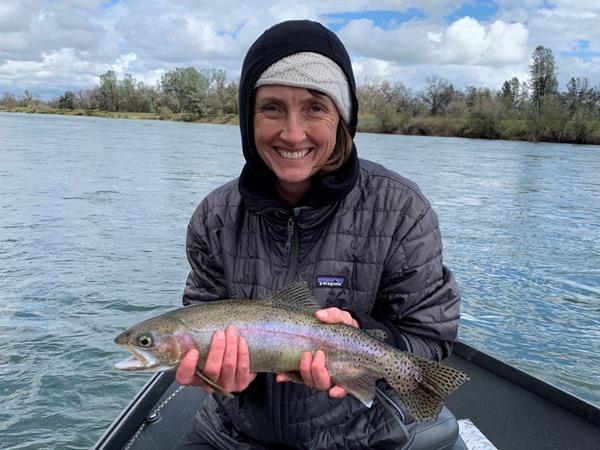 I know Nellyda had a great time and I’m pretty sure she is hooked on fishing the Lower Sac. 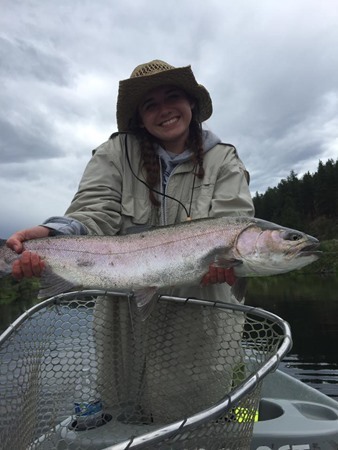 Nellyda was rewarded with this very nice fish! I made it out of the office today and into my drift boat for the first time in a while. 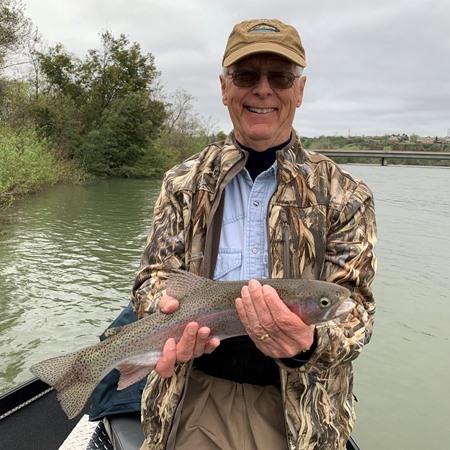 I had the pleasure of guiding a group from Project Healing Waters San Francisco. The weather was great and the fish were very cooperative today. 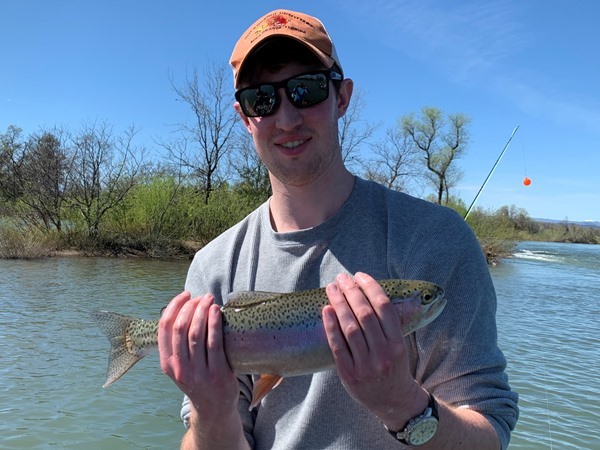 Leland landed his first trout ever, a nice 18" rainbow. 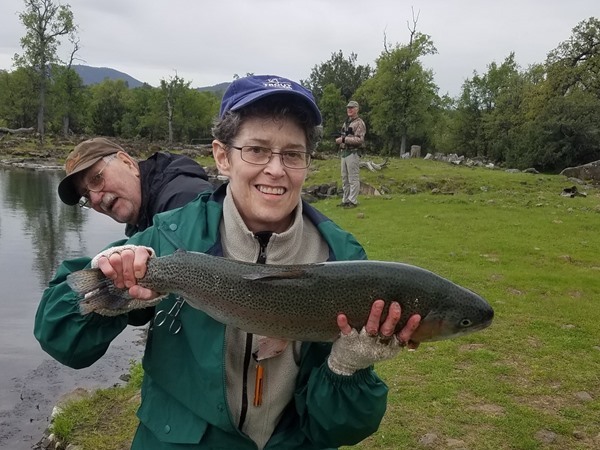 Henry, one of the volunteers with the group, landed a very large trout in the 22 inch range. 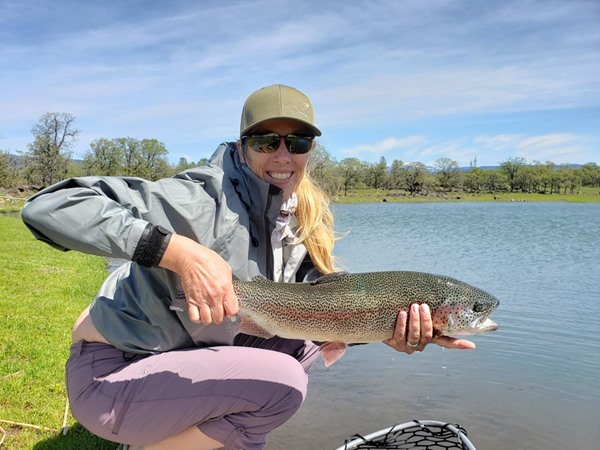 It was a fun day and there were plenty of hook-ups with strong wild rainbow trout. I once again felt privileged to be a part of another Project Healing Waters trip. We were one of seven boats today, and although it was busy – everyone hooked into fish! I had such a great time with my veterans (guests) Ray and Joe! The grab was pretty consistent for us all day, but the afternoon was better than the morning. 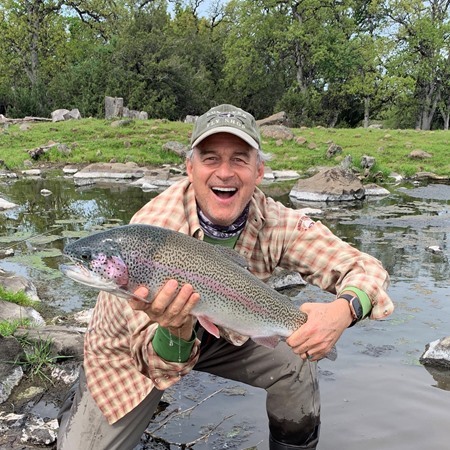 We hooked lots of fish – we landed a bunch and lost a bunch. We lucked out with the weather and I’m pretty sure all the veterans and mentors had a great time! 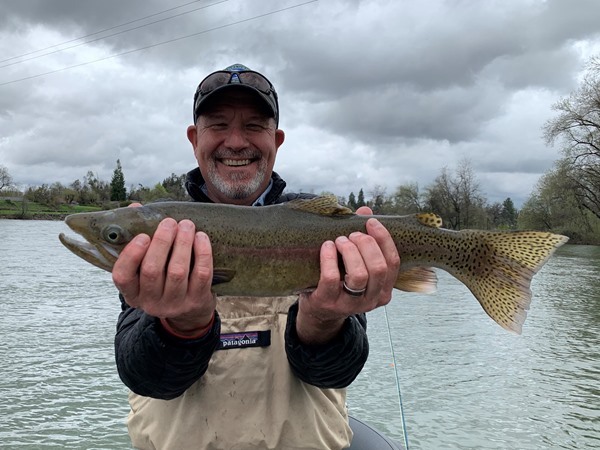 They are off the fish Eagle Canyon Trophy Trout Lakes tomorrow. With this latest batch of rain, the flows are going to bump up to 15,000 cfs Thursday morning. I don’t expect this to have a significant effect on the fishing – which has been really amazing! 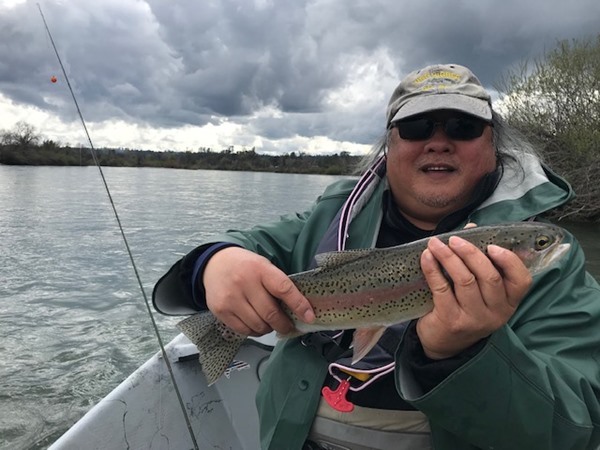 Ray's first rainbow on a fly!